There are a lot of tree ornaments that are symbolic. For instance the pickle, which is a sign of good luck. It would be the last ornament placed on the tree but hidden. On Christmas morning the first child to find it would be rewarded an extra gift from St. Nick. It was started so children would appreciate all the ornaments on the tree and not just what was under it. Then we have the mushroom, it was displayed on Christmas trees in Germany in honor of the peoples reverence for nature and in hope of good luck in the New Year. This year since I already have a pickle, I thought I would add some mushrooms. I could use a little more good luck. Here is the quick and dirty on how I made them. I removed the floral wire from the bottom of the spun cotton mushroom, added a eye screw on the top (because of the lacquer top I used my x-acto knife to poke a small hole to help the screw get started) and inserted a skewer on the bottom so it would be easier to handle. 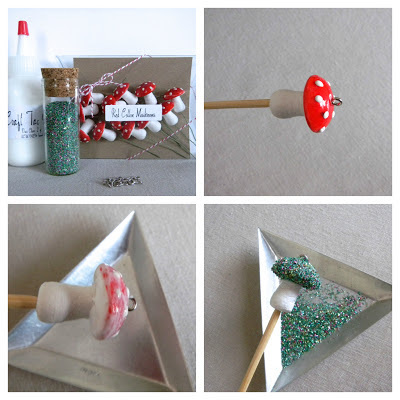 With a paint brush I brushed glue on the mushroom top and sprinkled with german glass glitter. Instead of a traditional hook I chose to use bakers twine. I am going to make a few extra to add them to my gift tags for Christmas. These are adorable! I have a glass ornament set that includes the pickle and I had to do some research on it to find out the story. I hadn't heard about lucky mushroom. These are super cute! I'm your newest gfc follower. I'd love for you to visit Posed Perfection and maybe even follow me. I love these!! My husband loves to photograph mushrooms, so I just might make some of these for our tree this year! What a great idea. They are so cute! Glad you linked up at "I Gotta Try That" Have a great Thanksgiving! Very cute! I don't think I've seen a mushroom ornament. Cute! |We have mushrooms from our visits to German Christmas markets. I've seen pickle ornaments and had no idea why?? Thanks for enlightening me and I love your cute mushrooms and the meaning with them, too! Thanks for linking up at Printabelle! These are so cute! Would love it if you linked up on my blog hop www.w-t-fab.com/search/label/bloghop. Also let me know if you'd like to follow each other! These are so adorable! What a wonderful addition to the Christmas tree :) Thank you so much for sharing your creativity at Mom On Timeout. Hope to see you back tonight! Super cute and easy! LOVE IT! What darling litle touches you have chosen to dress your Christmas tree! the glittered toppers are quaint and so very charming, my friend. Blessings and thanks for sharing your tutorial. So cute! I love mushrooms, but I never thought about using them for ornaments! Love hearing the original meaning of the ornaments, so interesting. Adore your mushrooms, thank you so much for sharing with us how you made them. 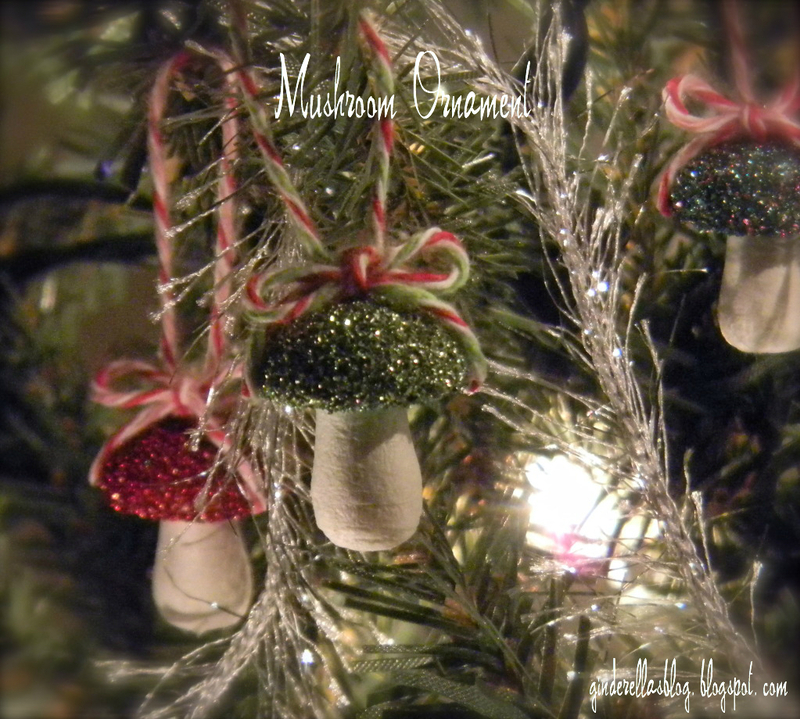 These mushroom ornaments are so cute! Thank you for sharing at my link party! These are too cute. I had no idea that there was a tradition surrounding the mushroom on the tree. Thanks for sharing on the Winter Wonders & Holiday Happenings party!